Since the invention of the Atomic Force Microscope (AFM) in 1986, we have constantly been developing new prototypes of the AFM, each allowing a broader range of samples to be imaged at higher spatial and time resolutions than ever before with the AFM. Much of our research in this area now investigates new methods for detecting the relative motion of the cantilever, construction of smaller, lighter cantilevers and creating new instrumentation to control the sample environment during the microscope's operation. It is our aim to develop the AFM to perform at its fundamental limits, and we believe there is still a vast amount of improvement the AFM can undertake until it reaches those limits. We hope to bring the AFM to a point where it can image far more biological processes in real time, such as image proteins continuously as they fold and misfold, making real-time videos of the processes involved. The need for faster AFM imaging at higher resolution has been noted in a spate of recent scientific papers, particularly in biology - the relative slowness and limited spatial resolution of currently available AFMs is a barrier to fundamental research. Because of its ability to image biological samples non-destructively and at extremely high resolution (down to tens of nanometers) under physiologically relevant conditions, and because of its versatility, the Atomic Force Microscope has been very successful in advancing biological research. Because of its gentleness in obtaining fine resolution, the AFM is used to study many biological samples which are far too small and delicate to be studied with other types of microscopes, such as viruses. It is also used to study the behavior of some biological systems in real time. Our group has used both commercial and prototype AFMs to monitor protein motion - we have studied real-time transcription, chaperonin structure and behavior, lysozyme structure and activity, and microtubule structure and behavior. We have also imaged nucleic acids (their structure and their real-time interaction with other proteins). We studied diatoms, unicellular organisms whose surface comprises nanostructured amorphous glass, in vivo - we imaged the structure of the living diatoms, and the strong natural adhesives they use, with the AFM. Please visit our biomaterials research section for more, and please see our entire publication list for a history of our work in using AFM for biological applications, which we hope will demonstrate the versatility of the AFM. A quick search of the term �Atomic Force Microscopy� in Web of Science ( http://portal.isiknowledge.com/portal.cgi?DestApp=WOS&Func=Frame ) and Pubmed ( www.ncbi.nlm.nih.gov ) delivers thousands of papers on the biomedical insights AFM has brought over the years and continues to bring. An example of two of these are recent and exciting biomedical discoveries made with the help of the AFM here at UCSB. The research group of Prof. Ratnesh Lal, a leading authority on AFM in biomedical research at the Neuroscience Research Institute, and their collaborators at other universities, determined firstly that a small amyloid that makes pathological plaques characteristic to all protein misfolding diseases, such as Alzheimer's, Parkinson's, and Huntington�s diseases, diabetes and tuberculosis, create nanometer-sized pores in brain and nerve cells. Ions like Ca 2+ can then enter the cell through these pores, (which are called ion channels) and disrupt cell homeostasis. This leads to premature cell death. This discovery was made possible by using the AFM to image ion channels. (Quist et al. PNAS, 2005). This discovery, in turn, presented the first structural evidence that amyloids that constitute various protein misfolding disorders form ion channels. Figure 1 Individual channel-like structures in planar phosopholipid bilayer membranes (representing cell membranes), induced by various types of pathological amyloid molecules in experiments. Image diameters range from 20-35nm. 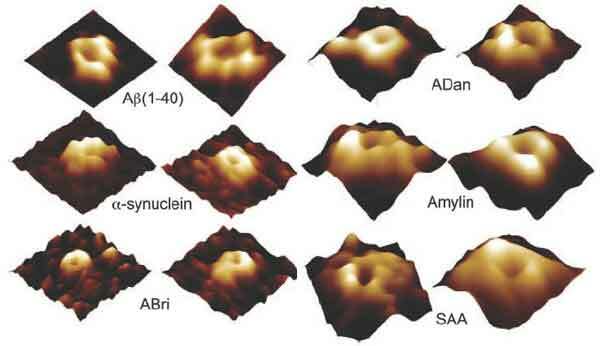 The authors also noted that the protruding sub-unit structures in the membranes could not be resolved with the limited resolution their AFM images. From Quist et al, PNAS 102:30, 10427-10432 (2005). Prof. Lal�s group�s second major recent discovery demonstrated that the AFM can not only be used to image biological structures at an exquisitely fine resolution, but that it can also be used to map surface energies � in this discovery, the surface energies of open and closed hemichannels [Thimm, J. et al. J. Biol. Chem. Vol. 280: 11, pp. 10646-10654). Hemichannels are pores in the cell membrane that provide an important interface between the cell interior and the surrounding milieu. Oxidative stress (such as the presence of free radicals) and other stresses will open hemichannels, which disturbs cell homeostasis and causes cell death. Using AFM, Prof. Lal�s group has shown that these hemichannels not only control the normal physiological states like regulation of cell volume and mechanics, but also are implicated in cancer and programmed cell death. Prof. Lal�s study also demonstrated that the AFM can be used to show conformations membrane proteins, like channels and receptors, in their natural states � not in crystalline preparations. For example, Prof. Lal�s group showed that the opening of hemichannels is dependent on the amount of divalent calcium ions in the cell�s environment, and not appreciably on any other type of divalent ion appearing naturally in the body. The AFM, therefore, is not just an imaging tool � it can reveal the physical and chemical properties of the structure being investigated. Prof. Lal�s work here has brought into sharper view a system related to our earlier work (Hoh et al. Biophysical Journal, 65, 149 (1993)) in which gap junctions were not as clearly defined. Limitations of present AFMs did not allow Prof. Lal�s group to observe conformational change at truly fast rates. Recent advances in our lab will hopefully alleviate this limitation. Figure 2 Energy map of the open conformation of a hemichannel, also showing the structure of the hemichannel. (The lighter the color, the higher the energy concentration). Twelve bumps, or protrusions, can be seen around the opening, as each hemichannel is surrounded by six connexin subunits that contain two loops in each. Each pair of loops within a connexin is numbered with the same colored number. Previous AFM studies of hemichannels did not resolve more than one of these pairs. AFM topographs can reveal sub-molecular features of functional assemblies of interacting biomolecules. A recent review (A. Engel and D.J. Muller, Nature 7:9 715-718, 2000) of the AFM's ability to study single biomolecules at work included a short review of a study of conformational changes in the porin OmpF. Porin OmpF is a trimeric membrane channel protein, so it creates a channel for specific molecules to be transported in and out of the cell. It is also a major outer membrane protein of E. coli. It forms long loops at the extracellular surface, which normally protrude from the cell at a height of 1.3nm. Engel and Muller showed with the AFM that, under certain conditions, the channel can close by a displacement of the loops to a height of only 0.6nm from the cell surface. Those conditions are: (i) the application of an electric potential of >200 mV across the membrane; (ii) the generation of a K+ gradient of >0.3 M; and (iii) acidic pH. E. Coli may therefore be adapted to survive the acidic conditions of the stomach by automatically closing their pores. Please see Figure 3. Figure 3 Conformational changes of loops of the protein porin OmpF 18 that protrude through the cell's outer surface, under varying conditions: a , The atomic model of the periplasmic surface rendered at 0.3 nm resolution (left) exhibits features that are recognized in the unprocessed topograph (right). Short beta-turns comprising only a few amino acids are sometimes distinct (oval and circle). b , The extracellular surface of OmpF. The comparison between the atomic model (left) and the topograph (right) illustrates that the loops that protrude 1.3 nm from the bilayer are flexible. The asterisks mark the twofold symmetry axis of the rectangular unit cells housing two porin trimers. c , pH dependent conformational change of the extracellular surface. At pH of less or equal to 3 the flexible loops reversibly collapse towards the center of the trimer thereby reducing their height to 0.6 nm. d , Conformational change of porin induced by an electrolyte gradient. The monovalent electrolyte gradient across the membrane was >300 mM. Similar to the pH dependent conformational change, the extracellular domains reversibly collapsed onto the porin surface. 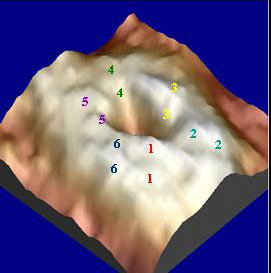 The topographs exhibit a vertical range of ( a ) 1 nm ( b ) 1.5 nm, and ( c , d ) 1.2 nm. (Taken almost verbatim from A. Engel and D.J. Muller, Nature 7:9 715-718, 2000). We are now focusing our use of the AFM on imaging bone fracture surfaces, and for single-molecule force spectroscopy - using the AFM to pull on single molecules, as well as on assemblies of molecules, to study and determine mechanical properties and structural features of molecules and molecular assemblies. We take part in an interdisciplinary collaboration of Physics, Chemistry, Marine Science, Materials Research Laboratory and Engineering labs at UCSB. This collaboration is partially funded by a NASA grant, the Princeton-based inter-university NASA University Research Education Technology Institute (URETI) for Bioinspired Materials (BiMat) � www.bimat.org , and partially funded by the Institute for Collaborative Biotechnologies, a UCSB-based inter-university Army research center. As part of this collaboration, we are continuing to study molecular fracture-resistance mechanisms in natural biomineralized materials. Biomineralized tissues such as bone and abalone are remarkably tough yet lightweight, and mimicking their design is highly relevant for the development of high-performance advanced materials. Our NASA grant funds this research for the development of high-performance, self-healing materials for aeronautical and space applications. We used the AFM to analyze the construction of abalone nacre, giving an unprecedented insight into what makes abalone shell so tough and yet so lightweight (Smith et al. The Molecular Mechanistic Origin of the Toughness of Natural Adhesives, Fibres and Composites . Nature 399: 761-763 (1999)). From these studies, we ascertained that a natural protein-based polymer matrix glue holds the nacre tablets together and plays an integral role in maintaining the strength and fracture resistance of the shell. We are now studying another mineralized tissue, bone, for its noncollagenous protein matrix that also acts as a glue, sticking the mineralized collagen fibrils of bone together (Fantner et al. 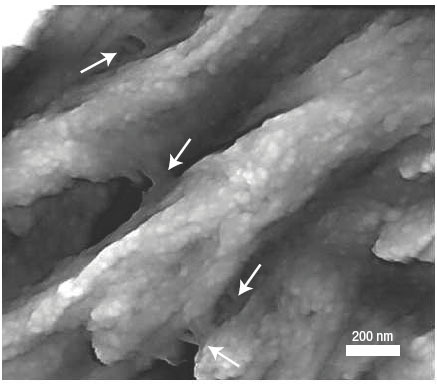 Sacrificial bonds and hidden length dissipate energy as mineralized fibrils separate during bone fracture . Nature Materials 4:8 612-616 (2005)). Figure 4 AFM image of a fractured bone surface showing bone glue. The fundamental building blocks of bone are collagen-1 fibrils, which are mineralized by being coated with knobbly mineral plates of hydroxyapatite, and a matrix of all many proteins apart from collagen-1 external to the mineralized collagen fibrils, that has many regulatory and mechanical functions. This image shows that the matrix also acts as an interface between mineralized collagen fibrils; the arrows superimposed over this image point to the protein matrix bridging collagen fibrils. Elements of the non-collagen-1 protein matrix have an adhesive role, contributing to the structural integrity of bone. We are studying precisely what those elements are, how they work, and how they fail in aging and disease. (This image was published in our recent paper, Fantner et al. Nature Materials, Vol. 4, p.612-616 (August 2005)).